A beautiful handmade design on a handmade Greek flip flop, with Orange twists, stars, beads and a ladybug.A classic baby sandal, made softer for little toes, decorated with bows and a ladybug. 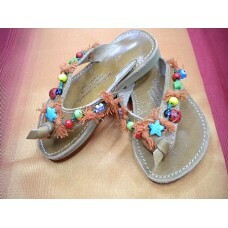 They are handmade with authentic traditional Vachetta leather, used in Greek sandal making since ancient times. It darkens naturally with age and wear. NB: Due to Customer demand. We now only have decorative stitching around the outside of the sole, not on the strap.